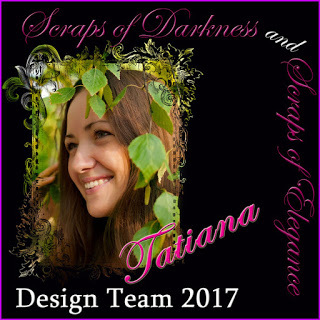 Tatiana is here with you today and I'd like to share my first layout featuring April Scraps of Darkness Blue Skies & Sunshine Kit. 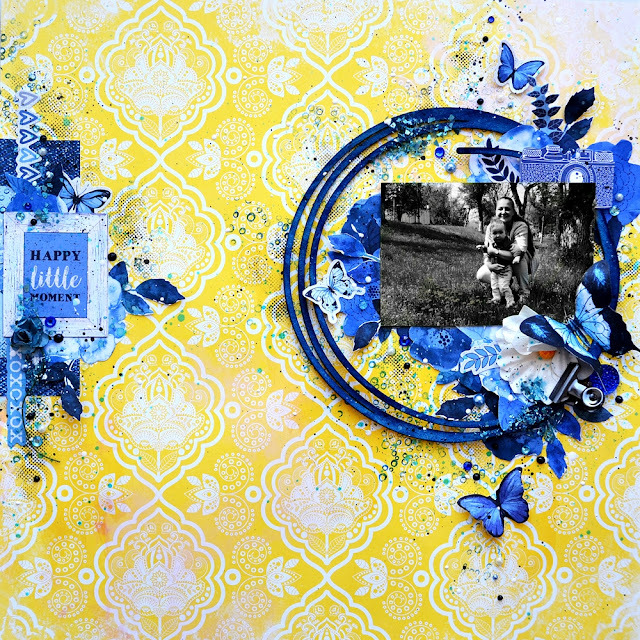 For the background of my layout I chose paper from BoBunny Petal Lane Collection and combined it with the embelishments from Kaisercraft Indigo Skies Collection. I think blue and yellow looks together wonderful. 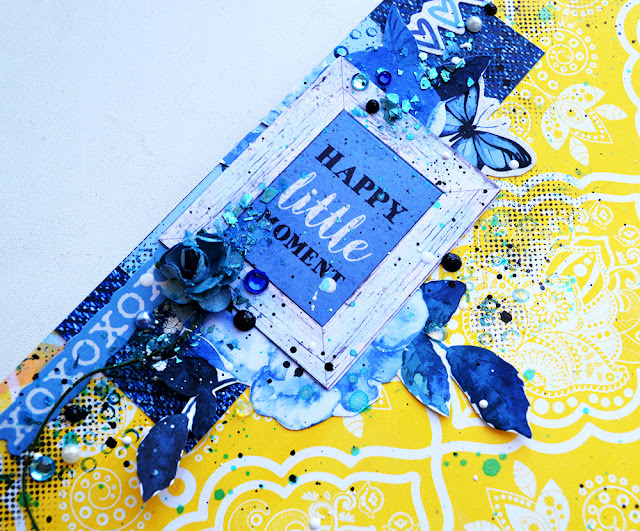 I started from background stamping and used bubble stamp from one of previous kits, Stazon ink and Prima Ingvild Bolm ink from the April kit. 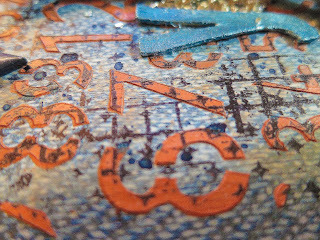 Blue Fern Studios chipboard circle was colored using Prima ink and I also added a little bit of water to blend color better using brush. On the left side of the layout I created small composition with several pieces of paper, stickers, collectebles and small flower. I also added background stamping there. 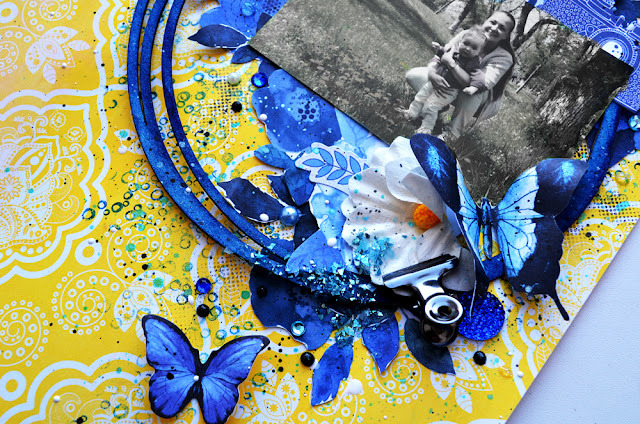 On the right side of the layout I created composition using stickers, collectables and daisy flower from the kit. I also added flowers which were cut from Kaisercraft paper included in the main kit and chipboard circle. For the final touches I used glass glitter from the Elements add on, sparklets, rhinestones, pearls and splashes with turquoise Lindy's mist, black Kaisercraft mist and white texture Tsukineko mist. Hope you enjoyed my project. All the best! 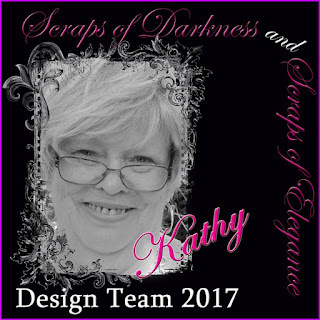 Hello Dear Scrappy Friends!! 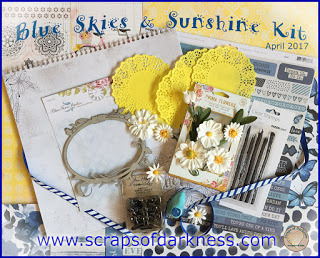 Kathy Mosher here to share with you another layout using the Scraps of Darkness April kit "Blue Skies & Sunshine". 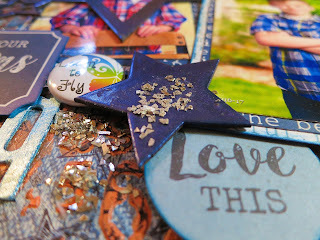 This layout is featuring school pictures of my youngest Grandson, Cameron for Kindergarten. Youcan see the difference in how his confidence grew as the year progressed. 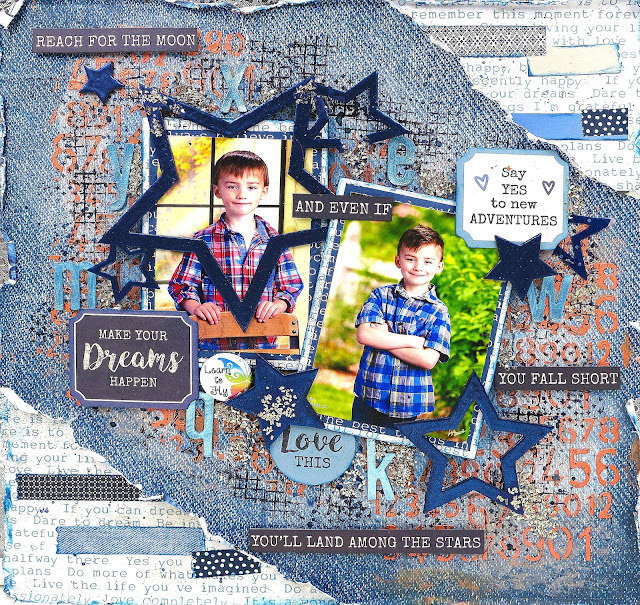 School pictures can be a little challenging to scrap layouts with. 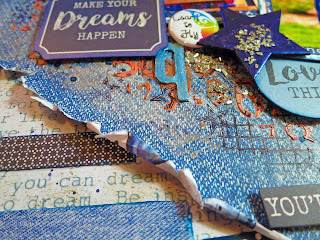 I really wanted to add a little pizazz to make it a fun layout, so I started by using the Kaisercraft "Indigo Skies" collection from the Main Kit. I ripped the corners of the main background paper to add a little interest. 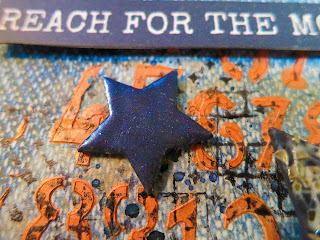 In the corners I fussy cut some of the strips from one of the Indigo Skies papers in the Coordinating Paper Add On. I also used the Prima Fluid Chalk Inker "Blue Jay" included in the Main Kit to ink around all the papers and elements I used. 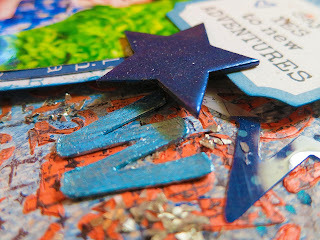 Once I got it all glued down I applied some gesso to brighten up the denim look and make my media pop from the page. Then I used a Dylusions stencil with numbers to symbolize the school theme. 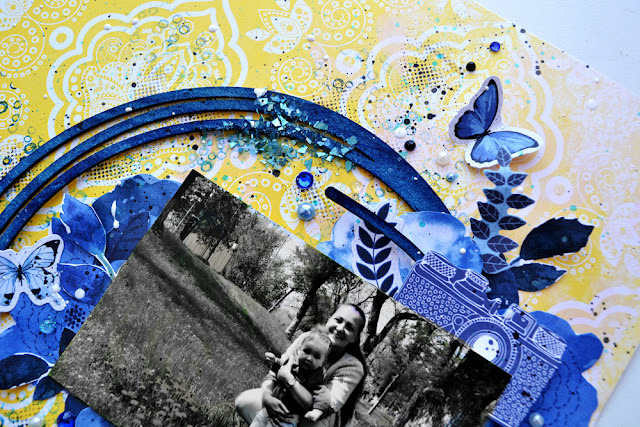 I used the Nuvo Embellishment Mousse that is included in the Creativity Add-On which added some fun color with the blue. I splattered inks and began to stamp around the page. 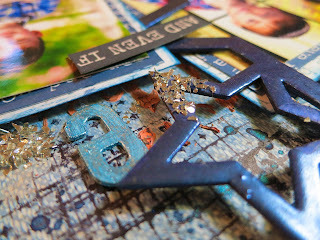 I had these cool star chipboards in my stash that I have been wanting to use for a masculine layout. 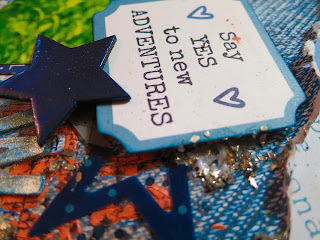 I embossed them with 2 different powders to get the blue color I wanted. 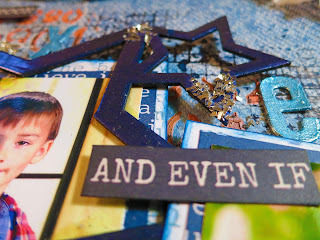 I used 2 die cut sentiments from the Elements Add On that worked perfect for the layout. Next I used some Thicker Alphabet Letters around the page to once again, symbolize the school theme. I used gesso on them first so that the Art Alchemy Paint (Magical Pond) from the Color Add On would adhere to the letters with a smooth finish. All that was left to make my layout pop was to add a little Glass Glitter from Prima, which came in a previous kit. I sprinkled little bits in various places. And, last I added phrase "Reach for the Moon, and if You Fall You Will Land Among the Stars", so perfect for the my little guy's first school pictures. This phrase was actually printed in the selvage of one of the papers. I hope you enjoyed the details about my layout and will stop by again real soon. I also hope you will consider this your home away from home and become a member of our kit club. Beautiful pages! In your second page, I love how you put the big star over the photo!